UU’s Brandon McRae (pictured) earned the win in Wednesday’s 14-5 victory over visiting Wright State-Lake. 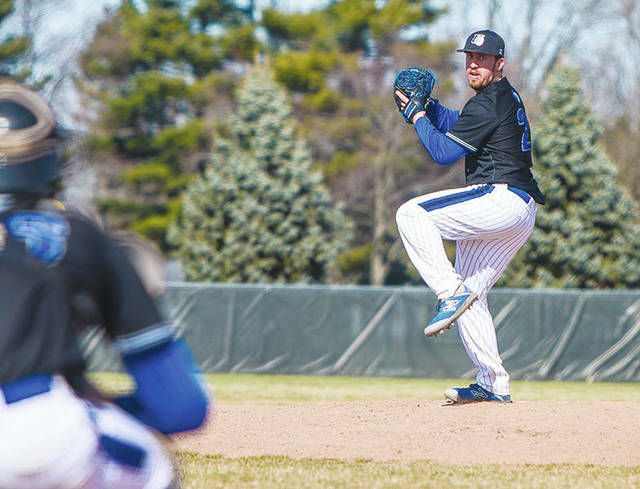 Urbana University scored six runs in the eighth inning to power past visiting Wright State-Lake, 14-5, in non-league baseball on Wednesday. UU had a season-high mark for runs and equaled their season-high hits total with 14. The Blue Knights outhit the Lakers 14-10 and both teams had four errors. Three UU players delivered three hits, including Robbie Guerrero III (3-5, 4 RBI) and Hunter Cohee (3-5, 3 RBI), who both homered. Making his debut in the leadoff spot, Brett Bell (3-6, 2 RBI) also had a career-high three hits with a pair of doubles. Chase Carney kept rolling with his ninth multi-hit effort, extending his hit streak to six games, while Triad graduate Briley Harlan (1-3) notched his first career double. UU cycled through seven pitchers in the nine-inning contest as Brandon McRae (1.2 IP) picked up his first win. The junior right-hander took over with one out in the fifth and induced a double play on his first pitch. He came back out for the sixth after the Blue Knights regained the lead on Guerrero’s RBI single. The visitors jumped out to a 2-0 lead, but UU countered with three runs in the bottom of the first. Lake scored one in the fifth to even the score before the Blue and Grey responded again. UU put the game out of reach with four runs in the sixth and six more in the eighth. The Blue Knights led 8-3 after seven innings, but the Lakers rallied with two runs on three hits to begin the eighth. However, Taylor Lane took over on the mound and promptly retired the side. Lane recorded a career-high three strikeouts and finished the game to pick up his first save as a Blue Knight. UU improves to 6-18 on the season and will host MEC-leading Shepherd University in a four-game series this weekend. https://www.urbanacitizen.com/wp-content/uploads/sites/36/2019/04/web1_uubaseball.jpgUU’s Brandon McRae (pictured) earned the win in Wednesday’s 14-5 victory over visiting Wright State-Lake.